Today we’re going to talk about why you need to think if your room as one large speaker. It’s a little bit of a push on the analogy but I think if we look at the room as a speaker we’ll get more of an understanding about what we have to deal with in terms of acoustical treatment and understanding how some frequencies won’t fit and what we need to do to work with them. So what are we talking about inside our speaker cabinet? Well we have lots of pressure so we have a movement of a diaphragm back and forth that’s attached to a fixed structure, the face of the speaker. That produces a lot of pressure with inside the cabinet and there’s all kinds of calculations that you can do to figure out the volume of the speaker and what frequency it will crossover with even the frequency of the port if it’s a driver. We won’t go into all those parameters right now but just look at as your room speaker being one large speaker. So we have all this pressure inside the cabinet, what else do we have? Well we have lots of reflections so with the pressure comes higher frequency reflections inside the speaker cabinet. We definitely have that in our room so I mean pressure and reflections are the two main things that we have to deal with, mostly unwanted pressure and unwanted reflections. So we have all these reflections and all these all this pressure inside the speaker cabinet. Where’s it going to go? Well sometimes it goes out just like in our rooms, sometimes it goes straight forward from the driver just like in our rooms, so all kinds of release from the pressure just like in our room. If you’ve ever been in the room next to a room where there’s a subwoofer you’ll understand what I’m saying. So our speaker does have the pressure and reflection issues that a room has. Also diaphragmatic movement. Speaker manufacturers go to great extent to design their speaker cabinet so it’s inert or it won’t move or moves very little and you see all the time in reviews the accelerometer test on the cabinet. It’ll show you what frequencies the cabinet is moving out sort of speak. So with all this pressure inside the cabinet the cabinet itself starts to move a little bit, so it goes diaphragmatic, the diaphragm or the room starts to move. Well any movement over big surfaces causes noise or sound. So these are issues that we have to be very careful of when we build structures and then always our room modes. So you have a lots of room modes in a small cabinet I mean we have lots of room modes in a large room can you imagine what it’s like in a small speaker cabinet. Those modes have to be tamed all kinds of things have to be done with them, a lot of people are putting our foam inside their cabinets now and that controls the middle and high frequency modal issues with inside the cabinet. Carbon will also control the low frequency so the same kind of treatments that we use in a room situation we can use inside our speakers. 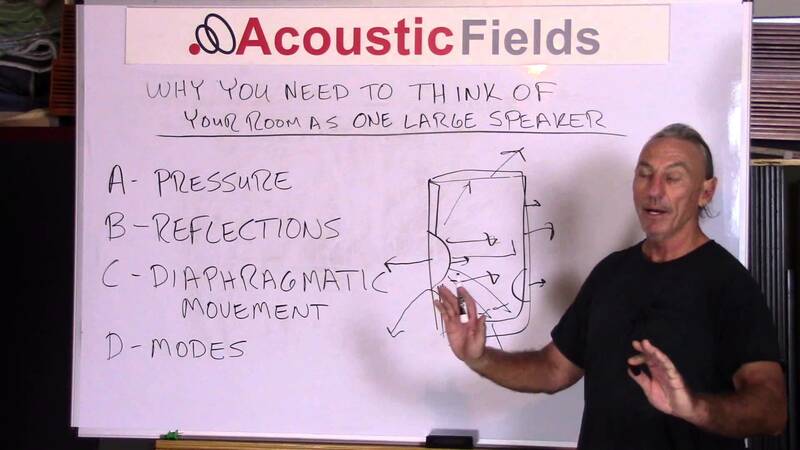 So pressure and reflections, diaphragmatic movement, modes, all the things that are present in a room is why you need to think if your room as one large speaker. I hope this discussion helped. Feel free to contact me directly at: 520 – 392 – 9486 MST or info@acousticfields.com. If you would like to learn more about room acoustics please sign up for my free videos and ebook by joining the mailing list here. And if you would like your room acoustic issues analysed for free by me then please fill in the form here and I will be happy to take a look for you. ← What is the biggest pitfall to avoid when building a drum room?